He's worried that "private insurers continue to be a part of the health scheme"
WASHINGTON (CNN) -- President Obama often talks about all of the forces lining up against his health care plan. But there's one critic who has remained relatively mum in the debate. Dr. David Scheiner was President Obama's personal physician for 22 years. David Scheiner, a Chicago, Illinois-based doctor, has taken a hard look at the president's prescription for health care reform and sees bad medicine. "This isn't that kind of health care program that I think is going to work," he said. So what makes Scheiner so special? He was Obama's personal physician for 22 years, and voted for the former Illinois senator in the 2008 presidential election. "Everybody keeps saying we don't want the government involved in health care," Scheiner said in an interview. "But the government is involved in Medicare, and it works." Scheiner would rather see the nation adopt a single-payer system like the ones in Canada and Europe. The financing system relies on one "payer" -- which could be a government-run agency -- to fund all health care costs billed by doctors, hospitals and other health professionals. It's something that an up-and-coming coming state Sen. Obama talked about six years ago. "I happen to be a proponent of a single-payer universal health care plan. ... But as all of you know, we may not get there immediately, because first we've got to take back the White House, and we've got take back the Senate, and we've got to take back the House," Obama said in 2003. "If I were designing a system from scratch, then I'd probably set up a single-payer system. But the problem is we're not starting from scratch," Obama said in Albuquerque, New Mexico, in August 2008. "Nobody is talking about some government takeover of health care. I'm tired of hearing that," Obama said in Raleigh, North Carolina, on Thursday. "We don't even fully know what the public option is going to be. If the public option is too good, patients who are sick will flock to it, and I'm not sure it will be able to support itself." "I just hope that the Congress, the American public and the president will hear some of my words," he said. "We've got to do something better." Scheiner finally had a chance to have his say Thursday. He and other doctors who support a single-payer system gathered in Washington to meet with lawmakers and rally supporters. 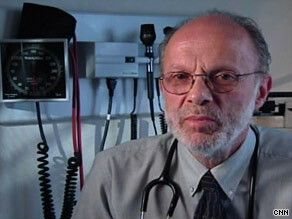 He may not be the president's doctor anymore, but Scheiner says he's trying to save the patient before it's too late. CNN's Ed Hornick and Brittany Cummings contributed to this report.